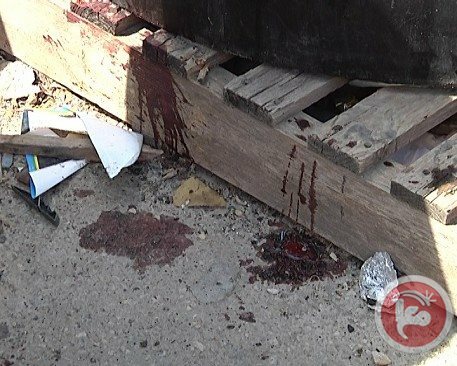 A man killed by Israeli forces in Jenin on Tuesday was executed in cold blood after confirming his identity to soldiers, family members said. 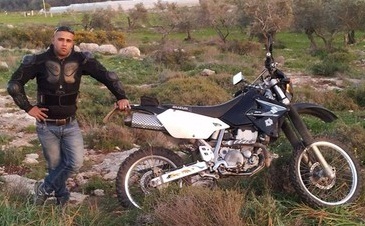 Islam al-Tubasi, 22, died from gunshot wounds during an Israeli raid on Jenin refugee camp, sources said. Al-Tubasi's brother, Ibrahim, told Ma'an that there was an explosion at the family home at around 6 a.m.
"I was sleeping on the second floor. Our house is a three-story building. I was surprised when I saw Israeli undercover forces, dressed in black, raiding the second floor. They assaulted me, and asked me my first name. When I told them my name is Ibrahim, they held me inside the bathroom on the second floor. They assaulted my mother who was also on the second floor," Ibrahim told Ma'an. Another brother, Mustafa, said that after Israeli forces shot Islam in the leg they forced him to go to the roof to identity him. 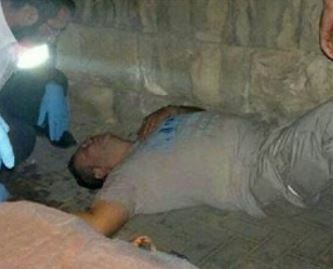 The soldiers then dragged Islam's body downstairs and Mustafa says he heard several more gunshots. "I am sure that Islam was shot dead before he was transferred to hospital via military ambulance," he added. Kamal al-Tubasi said that Israeli forces shot Islam in the leg as he lay in bed, before dragging him downstairs and executing him. Witnesses in the camp confirmed that they saw Israeli special units enter the building and go onto the roof, where Islam was sleeping. Clashes broke out with local residents following the shooting of al-Tubasi, with dozens of camp residents injured by stun grenades, tear gas and live fire. Salah Nael Ghazzawi, 13, was shot in the leg and taken to hospital for treatment. Israel's army said in a statement that shots were fired at Israeli soldiers while arresting a "wanted terror activist." "The wanted suspect was injured, evacuated by military forces for further treatment and later died of his wounds in an Israeli Hospital," the statement said. 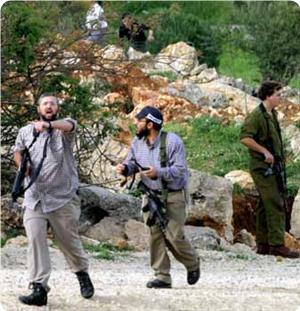 Local sources said that Israeli forces killed one of al-Tubasi's brothers in 2006. He was allegedly active in Islamic Jihad. The killing of Islam al-Tubasi is the latest in a string of violent incidents in refugee camps in recent weeks. On August 26, Israeli security forces shot dead three people and wounded 19 during fierce clashes that lasted for hours in the Qalandiya camp. The week before, Israeli troops shot dead one man and wounded two during an operation to arrest an alleged Palestinian militant in Jenin camp. 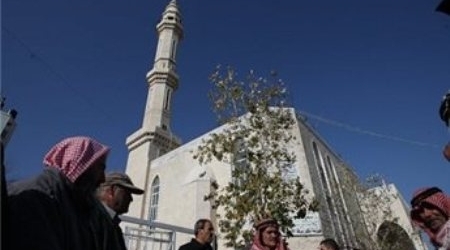 Last week soldiers and Palestinians exchanged fire at the Balata camp, in Nablus, as troops escorted Jewish worshippers to a to a flashpoint shrine there. There were no fatalities in that incident, but four Palestinians were wounded, two by live fire and two by rubber-coated bullets , Palestinian medical sources said. Palestinian medical sources have reported that a Palestinian youth was shot and killed by Israeli soldiers invading his home in the Jenin refugee camp, in the northern West Bank city of Jenin. Dozens of residents have been injured during ensuing clashes, and one was kidnapped. The Maan News Agency has reported that a large Israeli military force invaded that camp, during late night hours, and that the soldiers broke into and violently searched dozens of homes. The invasion led to clashes with local youths who hurled stones and empty bottles at the invading forces. Medical sources said that resident Islam Husam Toubasy, 19, was shot by rounds of live ammunition fired at him by the invasion soldiers who broke into his home after detonating its door. His family told Maan that, immediately after invading their property, the soldiers headed to the rooftop where Islam sleeps in his room, and shot him in the foot before dragging him onto the ground, taking him out of his home while he was heavily bleeding. His brother, Kamal, stated that after the soldiers shot and injured Islam, and dragged him out of the home, undercover soldiers of the Israeli army shot him again, the Palestinian News & Info Agency (WAFA) has reported. The army then moved him to the Al Khodeira hospital, inside the 1948 territories, where he died due to the massive bleeding he suffered as a result of his injury. The family said that the soldiers forced them in one room, and that they saw Islam bleeding and unconscious before the soldiers took him away. The soldiers did not allow the family to help their son. Army then withdrew from the camp, but re-invaded it, and the city of Jenin, in the morning, leading to clashes with dozens of local youths. Eyewitnesses said that at least twenty armored Israeli military vehicles, and a military ambulance, invaded the area, leading to clashes with dozens of students heading to their school. The soldiers fired more rounds of live ammunition, gas bombs and concussion grenades at the residents leading to several injuries. One of the wounded, Nael Ghazzawy, 13, was shot by a live round in his leg while standing at the balcony of his home. 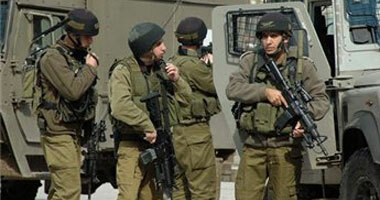 Soldiers also kidnapped a resident identified as Mohammad Bassam Al-Fayed, 21, and took him to an unknown destination. It is worth mentioning that, in 2006, undercover soldiers of the Israeli army, shot and killed Ahmad, the brother of Islam, and demolished his home. Their brother Sa’id, is a political prisoner held by Israel after being sentenced to 32 years imprisonment by a military court. Earlier on Tuesday, Israeli soldiers invaded various Palestinian communities in different parts of the occupied West Bank, and kidnapped at least nine Palestinians. On Monday, Israeli soldiers kidnapped at least fifteen Palestinians, including a legislator, in different parts of the occupied West Bank. The invasions are part of daily violations carried out by the army against the Palestinians and their property in different parts of occupied Palestine. Israeli forces on Tuesday raided an area of land near Nablus which was formally the site of Homesh settlement, locals said. On Monday, Israel's military said that land confiscated in 1978 by a military order would be returned to its Palestinian owenrs. The land, which belonged to the village of Burqa, was used to build the settlement of Homesh, which was evacuated in 2005. Witnesses said that five military vehicles raided the area on Tuesday and remained there for over three hours. They then left the area without providing an explanation, locals said. Palestinians say that armed Jewish settlers have been trickling back to try and reestablish a permanent presence there. "Thirty-five years have passed since the land was taken from its lawful owners and now we have been informed that they can lawfully return to their land," Yesh Din said in a statement on Monday. "To our regret, we are well aware of the permanent and illegal presence of Israelis at the site," it went on. "We hope...that the law will be enforced and the Israelis staying there will be removed and the Palestinian owners can return safely to their lands." Land confiscated by Israel 35 years ago to build a Jewish settlement in the West Bank will finally be returned to its Palestinians owners, the Israeli military said on Monday. In 1978 Israel confiscated by military order land belonging to the Palestinian village of Burqa in the northern West Bank. It was used to erect an army encampment and later became a government-authorized civilian settlement. It was shut down with three other small remote West Bank settlements alongside Israel's withdrawal from the Gaza Strip in 2005. The order requisitioning the land from the Palestinians remained in force however, prompting Burqa residents to petition the Israeli Supreme Court in December 2011. "The decree that established Homesh...was nullified several months ago as a result of an appeal brought to the Supreme Court," the Israeli military forces spokesman wrote Monday in response to a query by AFP. "In addition, the closure order that restricted the access of Palestinians to the land was lifted, and the representatives of the petitioners were notified," he added. 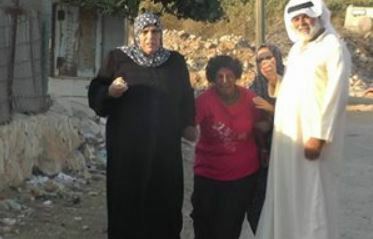 He went on to say that by military order Israelis were now barred from the site, but Israeli NGO Yesh Din, a party to the Burqa residents' petition, said that settlers were still there. Despite the military ban, Palestinians say that armed Jewish activists have been trickling back to try and reestablish a permanent settler presence there. The far-right Jewish home party, which draws much of its support from the settlement movement, became a key player in the coalition government formed by Prime Minister Benjamin Netanyahu after January elections. Five Palestinians were injured by live ammunition during clashes that erupted Tuesday morning with the Israeli forces in Jenin refugee camp. PNN reporter said that clashes are still ongoing amid heavy fire shooting. Palestinian sources said that soldiers from the Israeli Army raided at dawn, Qalandiya refugee camp near the city of Ramallah and arrested three Palestinians. Israeli Authorities claimed that the three captured men were in possession of weapons and that they were arrested and transferred to security centers for interrogation. Several Israeli military vehicles and bulldozers raided lands east of Khan Younis, south of the Gaza Strip. Local sources said that eight vehicles launched from "Abu Reida" gate, east of Khuza'a village, penetrated into Palestinian-owned lands, 150 meters away from the border, while randomly shooting. It's worth noting that Israeli Forces are daily carrying out such incursions into Palestinian territory and violating the agreement that was signed between the Palestinian resistance and Israel under Egypt auspices in November 2012. Israeli occupation forces (IOF) advanced 200 meters into southern Gaza Strip on Tuesday morning and bulldozed land. Local sources told the PIC reporter that IOF soldiers in armored vehicles advanced into eastern Khuza’a town to the east of Khan Younis, south of the Gaza Strip, amidst random shooting. They said that the soldiers bulldozed land from eastern Khuza’a along the border fence heading north to Abasan Al-Kabira town. The sources said that the soldiers advance amidst intermittent firing as reconnaissance planes fly overhead, adding that the soldiers withdrew from the area after five hours. 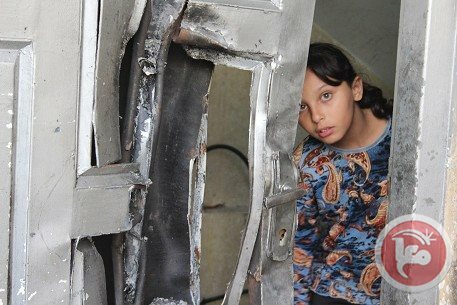 Tuesday at dawn [September 17, 2013] Israeli soldiers invaded various areas in the occupied West Bank, broke into dozens of homes, and searched them, before kidnapping at least nine Palestinians. 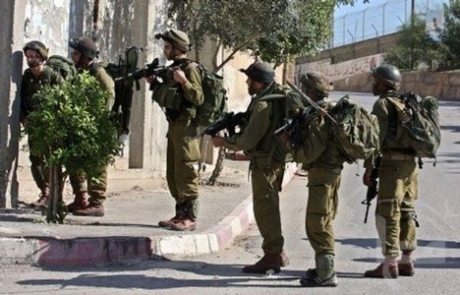 Local sources in Beit Ummar town, north of the southern West bank city of Hebron, have reported that dozens of soldiers invaded the town, violently broke into and searched several homes, and kidnapped two residents. The two have been identified as Aktham Yousef Ikhlayyel, 20, and Zein Hashem Abu Hashem, 17. Mohammad Awad, coordinator of the Popular Committee Against the Wall and Settlements in Beit Ummar, said that the invasion started at four at dawn, and that the army fired several gas bombs and concussion grenades in a number of neighborhoods during clashes with local youths who threw stones and empty bottles at them. 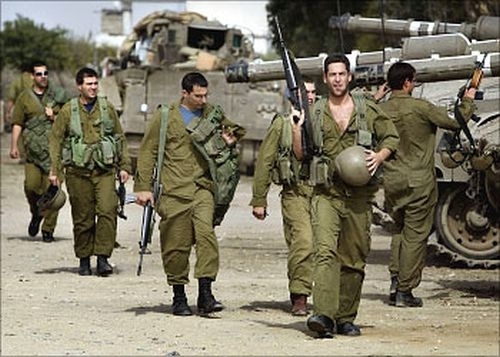 Furthermore, dozens of soldiers invaded the town in Ithna, west of Hebron, and Yatta city, south of Hebron, in addition to the Al-Fawwar refugee camp. Local sources said that the army closed main gate of the Al-Fawwar camp following clashes with local youths during which the soldiers fired several gas bombs and concussion grenades. The gate was reopened after 30 minutes of closure. Two more Palestinians have been kidnapped after the army invaded ‘Aboud village, north of the central West Bank city of Ramallah, and two more in Betunia, west of Ramallah. The two residents, who were kidnapped in Betunia, have been identified as Tha’er Fakher Ya’coub, and Abdul-Aziz Jibreel. 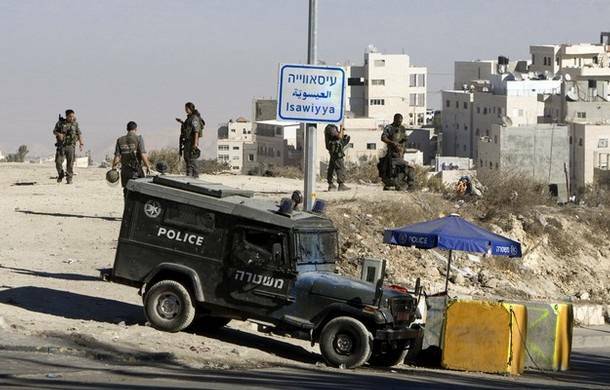 Several military jeeps also invaded Qalqilia city, in the northern part of the West Bank; and kidnapped two residents; the army claimed that the two are “wanted for security violations”. Several Israeli military jeeps also invaded the Jenin refugee camp, in the northern West Bank city of Jenin, and shot and injured one youth, and kidnapped him. opened fire at local youth protesting the invasion. Israeli Occupation Forces (OF) arrested at dawn Monday 16 Palestinians throughout occupied West Bank, Israeli media sources revealed. Israeli Kfir units conducted campaign arrest campaigns in different villages and towns in occupied West Bank at dawn Monday. In al-Khalil, nine Palestinians were arrested including two children and the eldest son of a leader in Hamas movement, who has been detained for 7 months in Israeli jails. Palestinian sources said that three Palestinians from Hijra village in al-Khalil were subjected to brutal attack by Israeli forces while two other youths from Idna town were severely beaten. Meanwhile, IOF soldiers detained a Palestinian child from Arroub refugee camp, north of al-Khalil, after clashes erupted at the entrance to the camp. The child was transferred to an unknown destination. Clashes erupted in Arroub camp after IOF soldiers stationed at a nearby watchtower fired tear gas bombs against Palestinian houses, causing breathing difficulty among a number of civilians. Other Palestinian youths were detained. In Qalqilya, IOF soldiers detained a Palestinian child while working in his parents' agricultural land. The child was subjected to brutal beating despite his difficult health situation where he had undergone several surgeries, according to family sources. Israeli Military forces (IMF) arrested 14 Palestinians on Monday at dawn from several cities in the West Bank, Israeli radio reported. It reported that the IMF stormed Ertah village southern Tulkarm and Madama village southwest Nablus and arrested two youths. Number of youth were also arrested in Deir Istiya to the southwest of Nablus , Jalazone camp northern Ramallah , Beit Ummar to the northwest of Hebron and Beit Awa southwest of Hebron. The IMF also arrested 3 youths from Hebron and took them to a disclosed place. Sunday evening September 15, 2013, an extremist Israeli settler attacked Palestinian children in Al-Eesawiyya town, in occupied East Jerusalem, and was violently beating them before attacking a Palestinian man who tried to stop him. The resident, Maher Ahmad Abu Leil, 48, suffered various cuts and bruises when he tried to stop the assailant who targeted children playing in the area. His sister said that he was heading to a Falafel shop when he noticed a settler using an iron bar to hit Palestinian children, and rushed to defend them. The settler then struck the man to the head with the iron bar, causing severe bleeding, and concussion. The man was then moved to the Hadassah Hospital in Jerusalem. Local sources said that the police arrived at the scene and apprehended the settler. [Sunday at dawn September 15, 2013] Palestinian medical sources have reported that two Palestinian day laborers have been injured by Israeli army fire in the Ramadeen area, close to the Green Line, near the southern West Bank city of Hebron. The sources said that the soldiers chased dozens of workers trying to cross into Israel to search for work, kidnapped two workers, and wounded two others. The two wounded workers suffered various burns as the army fired firebombs at them; one of the workers suffered fist degree burns. Palestinian medics said that Nash’at Nimer Bashir, 23, suffered various burns in his abdomen and arms, while Khaled Nimir Suleiman, 21, suffered burns in his back. Eyewitnesses said that the soldiers fired firebombs at a car transporting the workers causing it to catch fire. The wounded have been moved to the Hebron Governmental Hospital, in Hebron, and received the needed medical treatment. In related news, soldiers invaded Beit Ummar town, near Hebron, and kidnapped two children identified as Bader Ibrahim Abu Maria, 17, and Amjad Saber Abu Maria, 17. The two were moved to the Etzion military base; they were kidnapped after the army invaded Beit Ummar on Saturday night after midnight. Their families were not informed of their arrest, causing them to panic after being unable to locate them; the families were only informed on Sunday morning when the Israeli District Coordination Office told them that their sons would be sent to court soon for what was described as “security violations”. In related news, soldiers kidnapped three Palestinian children Ya’bod town, south of the northern West Bank city of Jenin. Army also installed several roadblocks in the Jenin district. Clashes erupted between the Israeli soldiers and the Palestinian youths after the latter closed a road that connects Ramallah with Al-Jalazoun Camp in the West Bank, locals said. According to witnesses, clashes broke out in the area when Palestinians protested over closing the road, no injuries reported. After constructing a check point at the road, the Israeli soldiers prevented the Palestinian citizens from entering the city and shut the iron gate leading to Beit El settlement. Witnesses said that dozens of settlers threw stones at the Palestinians and their cars standing near the checkpoint under the protection of the Israeli police, leading to sever damages of the cars. 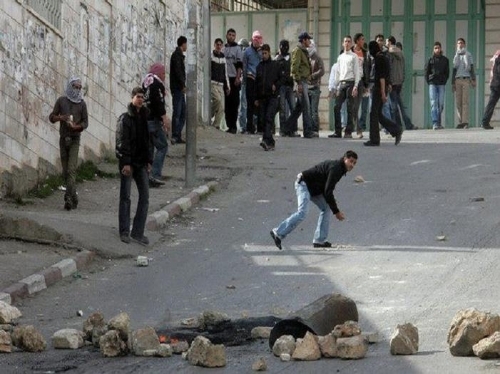 The Palestinians responded by throwing stones on the settlers. Sunday at dawn [September 15, 2013] A number of extremist Israeli settlers burnt an under construction Palestinian home south of the northern West Bank city of Nablus. Ghassan Daghlas, in charge of Israeli Settlements File at the Palestinian Authority in the northern part of the occupied West Bank, has reported that a group of settlers infiltrated into Madama village, near Nablus, and burnt the property. The official said that the fire consumed construction pipes, wood, and construction equipment. Daghlas added that the areas has been subjected to repeated attacks carried out by settlers living in a number of nearby illegal settlements, and illegal settlement outposts. Extremist settler groups are responsible for dozens of attacks targeting Palestinian orchards, cars, property and homes, and even torched and defaced several mosques and churches, in addition to defacing both Islamic and Christian graveyards. The Israeli occupation army imposed a hermetic closure on the West Bank starting dawn Friday till midnight Saturday to allow Israelis to celebrate Yom Kippur. Israeli war minister Moshe Ya’alon said that the procedure was necessary to preserve the lives of Israelis during the Yom Kippur celebrations. Meanwhile, Israeli occupation forces (IOF) detained a Palestinian citizen in Al-Khalil city on Saturday morning after breaking into and ransacking his house. Local sources said that IOF soldiers fired teargas canisters and metal bullets at houses and young men in the city prompting the youths to throw stones at them. IOF soldiers had stormed Arub refugee camp, north of Al-Khalil, on Friday and roamed its various streets and alleys but no arrests were reported. 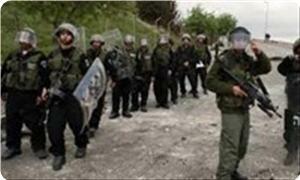 More than 50 citizens were rounded up in the refugee camp over the past few days in a series of IOF raids. Friday evening [September 13, 2013] A number of Israeli soldiers violently attacked a mentally challenged Palestinian woman in Beit Ummar town, near the southern West Bank city of Hebron. Mohammad Ayyad Awad, spokesperson of the Popular Committee Against the Wall and Settlements in Beit Ummar, has reported that dozens of soldiers invaded the home of Khalil Abu Dayya, in Safa area, and violently searched it. He stated that the woman, Nabila, 29 years old, tried to stop the soldiers who then violently attacked her, and went on to violently kick and push her around. Her brother tried to intervene but the soldiers threw a concussion grenade at him, and continued to beat the woman leading to various cuts and bruises to several parts of her body. Awad said that Nabila’s brother tried to tell the soldiers that his sister in mentally challenged, but they just kept beating her. The attack led to clashes between the soldiers and dozens of local youths; the army fired gas bombs and concussion grenades leading to several injuries. 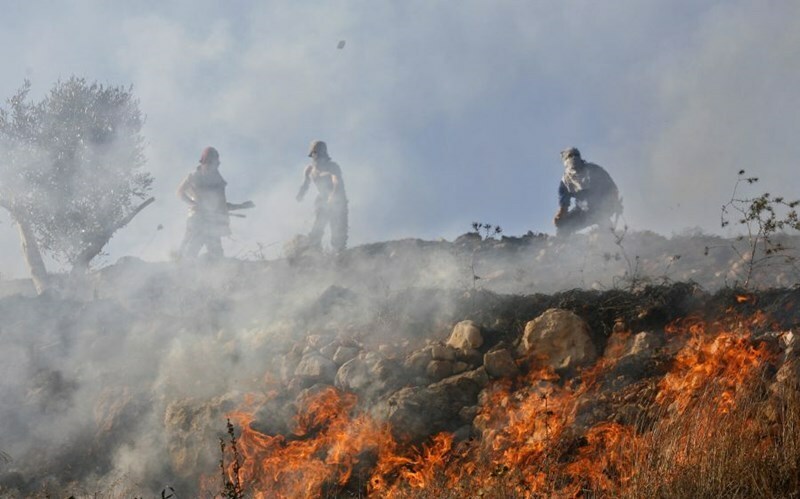 Awad stated that he believes the army invaded Safa area due to a fire that broke out in some trees that belong to Jewish settlers living nearby. More than a week ago, a number of Israeli soldiers and undercover soldiers of the army attacked a mentally challenged young Palestinian man in Al-Eesawiyya town, in occupied East Jerusalem, and violently beat him after forcing him into the ground and stepping on him. Ahmad Obeid was also kidnapped by the soldiers, and was released later on but was placed under house arrest awaiting trial. The Jerusalem District Court never set a trial date. 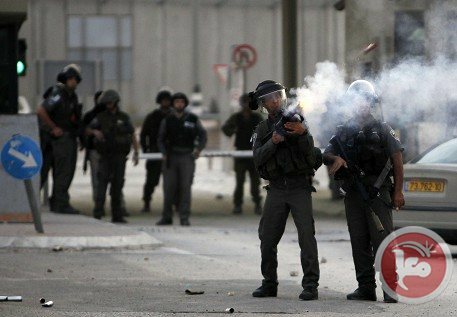 Friday evening [September 13, 2013] dozens of Israeli soldiers invaded the Al-Eesawiyya town, north of occupied East Jerusalem, and clashed with dozens of local youths. Local sources have reported that several military jeeps and a few Israeli police cars accompanied by a bulldozer, invaded the town, and placed a sand barrier connecting the town with the French Hill settlement, built on Palestinian lands. Mohammad Abu Al-Hummus, member of the Follow-up Committee in Al-Eesawiyya, stated that dozens of soldiers were deployed at the entrance of the town, since early morning hours Friday, as part of the strict closure enforced on the West Bank, and Arab neighborhoods in occupied Jerusalem as Israel marks “Atonement Day”. Last week, bulldozers of the Jerusalem City Council dug a tunnel in the Al-Eesawiyya road “French Hill Road”, to prevent the Palestinians from driving near the French Hill settlement. Dozens of Palestinian and foreign activists suffered injuries on Friday when the Israeli occupation forces (IOF) attacked their rallies against settlement activities in the West Bank. The residents of Kafr Qaddum along with foreign activists held their weekly Friday demonstration despite increased repression by the IOF in the last two weeks. At about 10:00 in the morning, dozens of soldiers in nine military jeeps arrived in the village and positioned themselves on the top of the hill overlooking Kafr Qaddum and on the closed road that leads to the illegal Israeli settlement, Kedumim, according to eyewitnesses. 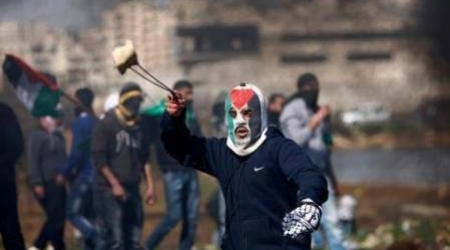 The soldiers shot both tear gas and stun grenades before the demonstration even started. 25-year old Nisfat Ishtewi was struck in the head with a tear gas canister and received medical attention. During the midday call to prayers, soldiers overlooking Kafr Qaddum repeatedly fired tear gas in the direction of the mosque and many canisters fell into its yard and the surrounding houses, despite the fact that there were no clashes with protestors at that time. When the march began, protesters from Kafr Qaddum and foreign activists marched toward the closed road where they met extreme IOF repression. 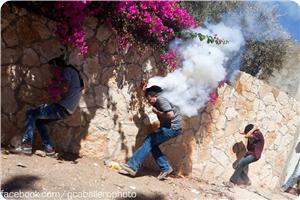 The IOF excessively fired tear gas, at times shooting tens of canisters at once towards the protest. Many protesters suffered from tear gas inhalation. As the IOF surrounded the protest, Israeli soldiers stationed themselves at the entrances of several houses and the residents were unable to leave or return to their homes due to the army presence. Moreover, the IOF persisted in firing tear gas canisters inside and onto the roofs of several houses which border the town's closed road. Palestinian paramedics repeatedly came to the aid of residents suffering from tear gas inhalation in their own homes, including children and elders. As protesters attempted to reach the area of the road barrier on the eastern edge of the town, the IOF brought a bulldozer and several army jeeps to prevent the demonstration from advancing and intensified the firing of tear gas. In Bil'in town, the weekly demonstration continued with protests in support of the prisoners in Israeli jails and against Jewish violations at the Aqsa Mosque as well as the illegal settlement activities and the apartheid wall. Dozens of Palestinian and foreign activists marched from the center of the town towards the annexation wall, waving Palestinian flags and chanting for national unity. As the protestors neared the wall, the IOF attacked them with a hail of tear gas and stun grenades, and rubber bullets, causing several of them to suffer severe suffocation. In Masarah town to the south of Bethlehem, scores of activists also suffered from tear gas inhalation as they were protesting Israel's settlement expansion. Ahmad Obeid is a young Palestinian man who cannot speak, and is suffering from a mental disability. Approximately a week ago, he was violently attacked and beaten by Israeli soldiers in Al-Eesawiyya, in occupied East Jerusalem, and is now under house arrest awaiting trial. A trial date was never set by the court. The soldiers kicked and punched him, and where just throwing him around despite his pleads and sign language he used to communicate with the soldiers. However, the soldiers showed no mercy and continued to assault the youth before kidnapping him. Obeid was kidnapped during clashes that took place in Al-Eesawiyya after Israeli soldiers shot and killed three Palestinians in the Qalandia refugee camp, north of occupied Jerusalem, and injured dozens of Palestinians. Many of the wounded suffered moderate-to-severe injuries as the army used dozens of rounds of live ammunition against the unarmed Palestinians in the camp. Obeid was not participating in the protests, but was “captured’ by Israeli soldiers who showed no mercy, and just poured their hatred and racism onto this young man. After violently beating him, forcing his head onto the ground and stepping on his face and body, the soldiers went ahead and kidnapped him. His father had to plead with the court to release him, and presented all sorts of medical reports and documentation explaining the mental and physical situation of his son. Obeid was interviewed by a team of the Ehna TV, an Arab TV station run by young men and women, and broadcasts on the Internet inside historic Palestine to deliver the real voice and image of the indigenous Arab, Palestinian population in the country. His father told Ehna TV that Obeid was heading to the bakery to buy some bread, but was caught amidst the clashes, and a group of undercover soldiers of the Israeli military violently attacked his son, kicking and beating him, and threw him onto the ground before stepping on him, and kicked him over and over again. His mother said that when the soldiers kidnapped him they were beating him on his head, neck, back and every part of his body, and that he tried to communicate with the soldiers using sign language but they just continued to beat him. The youth was imprisoned, and later on was sent to District Court the first time, then for the second and the third time. He father then filed an appeal to the High Court after his son received additional 15 days imprisonment. The Central Court ordered the release of Mohammad after forcing his father to pay 2500 NIS bail (Around $705), and ordered the father to sign another document obliging him to pay additional 5000NIS fine, in addition to forcing the son to sign a similar document, as a guarantee to ensure his appearance in court later on. The son was then released, but was forced under house arrest until a court date is set. “At first they forced him under house arrest for 24 hours”, the father said, “Later they forced him under house arrest until a court session is held to look into his case, but we have no idea when will this session be held, he cannot go to school, and he cannot go out, I was never given a clear answer”. The case of this young man is one of not only hundreds, but also thousands, of cases of abuse carried out by Israeli soldiers and police officers against innocent Palestinian youths and children, and against physically and mentally challenged Palestinians in different part of occupied Palestine.